ARE YOUR HAIR FOLLICLES HEALTHY? What is a hair follicle anyway? The word follicle is derived from the Latin word follis, which means bag. 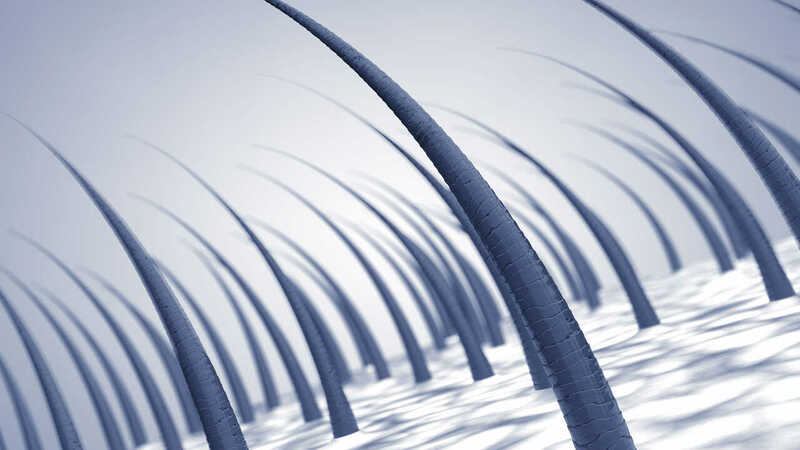 Hair follicles are tiny sacs lined by skin cells where hair grows and oil glands open. On a healthy scalp, 90% of the follicles are growing hair at any one time. Larger, healthy hair follicles grow thicker hair, and smaller hair follicles grow thinner hair. Unhealthy or aging follicles shrink, can become dormant or sadly, die. Once they die, it’s not possible for them to come back to life so let’s explore how to keep them alive. Many things contribute to damaged hair follicles; perms, relaxers, auto immune conditions, excess heat, hair color, genetics and ageing. About half of all people experience some hair loss by age 50, so don’t worry you’re not alone, but there is a lot you can do to help your hair follicles to be healthy. Imagine an unhealthy hair follicle. Now zoom in with an imaginary microscope and you’ll see that the fat cells, oil glands and proteins have been deprived from the follicle and hair shaft. The hair follicle is smaller than it once was and the hair shaft it grows is thin and weak. It’s also vulnerable to falling out at this stage. There are many ways to revive shrinking or dormant hair follicles including diet and nutrient supplements as well as laser therapy. But how can lasers wake up your hair follicles? It has long been known that red or near-infrared laser light promotes tissue repair and regeneration, and low-intensity light called low-level laser therapy (LLLT) stimulates cellular activity. LLLT has shown beneficial effects for a variety of medical conditions such as wound healing, nerve regeneration, joint pain relief, stroke recovery and hair growth. The at home-use Theradome LLLT helmet emits low power coherent monochromatic red light that induces hair growth by providing energy that stimulates a follicle reaction. In just 20 minutes twice a week, unhealthy or dormant hair follicles begin their revival journey towards growing new, thicker and stronger hair shafts. LLLT is clinically proven to reverse hair loss by minimizing shedding, thickening hair diameter and promoting new hair growth. But this only happens if an optimal dosage of energy is absorbed at the base of hair follicles. It’s important to understand that not all at home laser hair treatments are the same. If the right amount of energy doesn’t get to the right place, it isn’t worth your time. Let’s explore how to calculate optimal dosage and why that is important. Energy dosage, which in the case of hair is like a medical dose to treat an ailment, is measured in joules (J) per area in square centimeters (cm2). You can still get some small benefits from a very low dose. However, you need to aim for a higher dose when it comes to actually restoring healthy hair follicles. An optimal energy dosage is between 6 J/cm2 to 10 J/cm2. If you’re thinking that a longer treatment results in a higher energy dose, you’re absolutely right. The Theradome LH80 PRO is the only home-use laser hair device that provides a constant energy dose to the highest full-scalp coverage (582 cm2). Worn on the head for a total of 20 minutes 2 times per week, Theradome provides an energy dosage of 6 J/cm2 using generic power density calculations. An energy dosage of 6 J/cm2 provides effective stimulation of hair follicles. Stimulated healthy hair follicles = healthier and increased hair growth. ● A laser comb targets different areas of the scalp during combing for an average of 4 seconds. Assuming our generic power density, we get an energy dosage of only 0.02 J/cm2. This doesn’t stimulate hair follicles. ● A laser band normally gets used for periods of 30 seconds. Assuming a generic power density, with an energy dosage of 0.15 J/cm2, we fall short of achieving bio-stimulation again. ● A laser cap operates with pulsed lasers instead of emitting continuous light. Picture lasers turning ON and OFF during an entire treatment, which cuts the treatment time in half (15 minutes). This gets us an energy dosage of 4.5 J/cm2, which still isn’t enough. Rejuvenating unhealthy or dormant hair follicles can begin to regrow in just 4 weeks with the Theradome LH80 PRO. The team at Theradome are passionate about hair growth and helping people obtain healthy hair follicles.